A small section is dedicated to air-flown produce from Ehime prefecture in north-western Shikoku, Japan, which Emporium Shokuhin's chief executive officer, Mr Lim Li-Wei, 40, is working closely with. This is the first time produce from the prefecture is being exported. What: Yokan is a thick jelly dessert that comes in blocks. These (above) are made with Japanese citrus fruits yuzu and iyokan, which is similar to the Mandarin orange. Each slice bursts with flavour. What: Iwagi Island in the Ehime prefecture is known for its juicy lemons, which are harvested when they are still green. The tamami citrus is similar to the Mandarin orange in size and flavour. 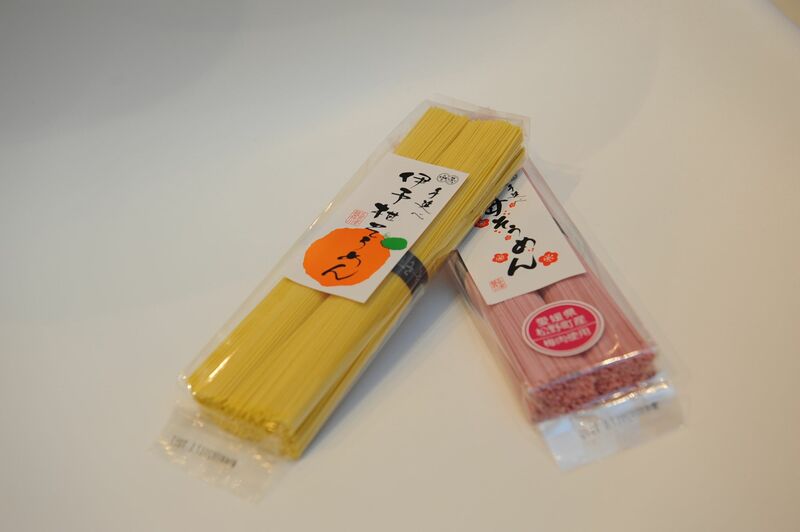 What: Instead of the usual ramen or soba, try these flavoured somen, which is a type of very thin Japanese noodles. These noodles are flavoured with ume (Japanese plum, above, right) and iyokan (above, left). What: Use it as a dip or jazz up salads with this ponzu from the Ainan town in Ehime prefecture. The area is known for its fishing and agriculture. What: These juices are also drinking vinegar, as apple vinegar is one of the ingredients. The blood orange and unshu orange from the Ehime prefecture are known to be sweet and juicy. What: This is not the fruit jelly, but a selection of ready-to-eat packaged konnyaku (made from starch of a yam species). They can be used in soups, as garnish or eaten straight from the packet. What: The wide selection includes gyozas, salmon and pasta, which just require reheating in the microwave. What: Each Alaskan King Crab weighs at least 3.5kg and is also served at in-house restaurants Takujo, Tsukeru and Gyuu+. What: This sandy-coloured flatfish is prized for its firm white flesh and flown in from Japan. What: At least 10 kinds of live oysters are available in the live seafood area. They are from France, such as the popular Gillardeau and Mont Saint- Michel, and lesser-known Utah Beach and Veules-les-Roses. The rest of the emporium houses eight dining concepts, from a Japanese-style bakery to a seafood wine bar. What: Sashimi and sushi lovers can head to this 102-seat sushi bar for its variety of offerings. Highlights include Giant Chirashi ($34), which has eight kinds of seafood such as salmon and maguro, and California-style maki. Shipments of 50kg of sustainable bluefin tuna from Nagasaki arrive on Mondays and Fridays. What: The 60-seat restaurant's signature item is its Ultimate Ramen ($17.80), where the soup is a blend of tonkotsu pork bone broth and broth made from simmering crab and prawn shells for hours. Noodles used are the straight Hakata-style ramen. Gyozas made in-house are also available. For those dining alone, sit at the counter where ramen is served from behind a screen, like ramen shops in Japan. What: Pair wines or sake with freshly shucked oysters or seafood platters at this 70-seat seafood and wine bar. 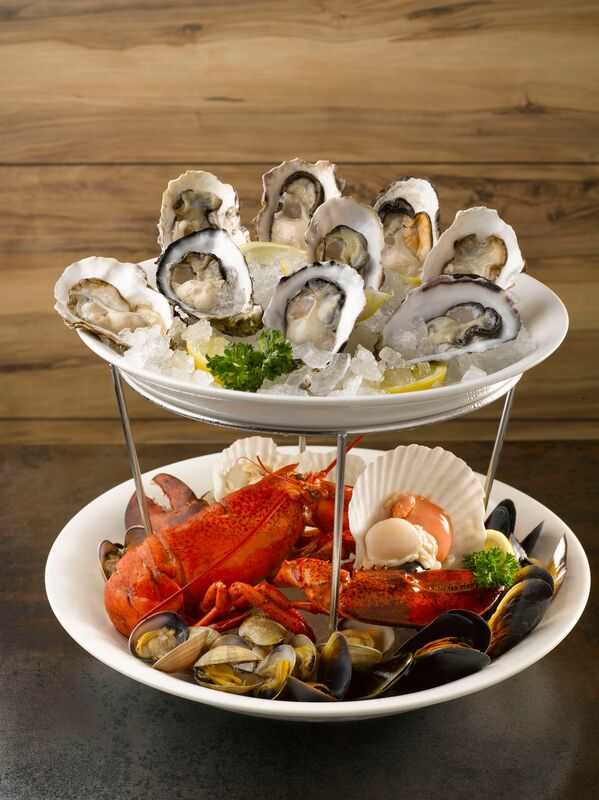 The signature Umi premium seafood platter (for two to three people, above) costs $118 and includes Boston lobster, dungeness crab, oysters, mussels, prawns and clams. The seafood can also be cooked a la plancha - on a hot grill. What: Diners get individual hotpots at this 108-seat shabu shabu outlet. Choose from local-style soup bases such as tom yum, bak kut teh and tomato, or Japanese ones such as konbu shoyu, miso and tonkotsu. Average spending a person is $50. What: One for the carnivores. This 106-seat grill-restaurant specialises in premium meats and dry-aged beef. 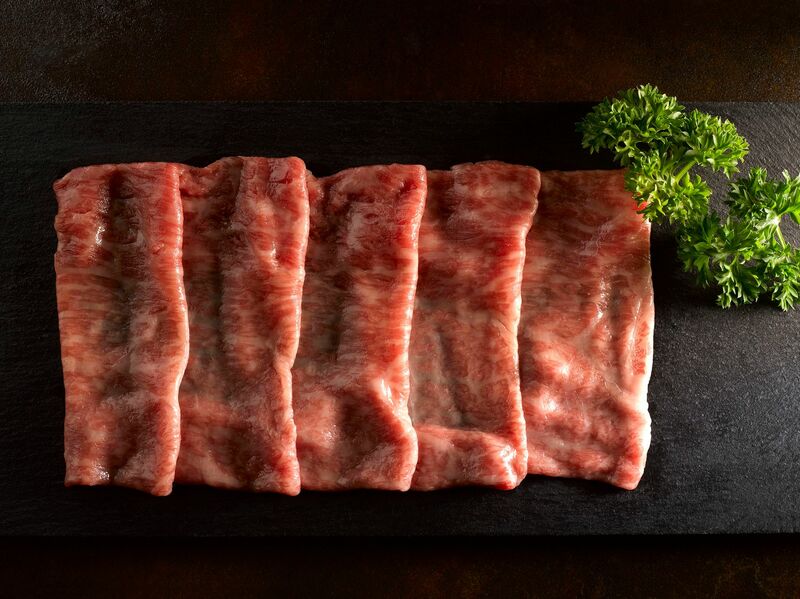 Do not miss the premium Miyazaki A5 beef slices (above), priced between $18 and $38 for 100g, depending on the cut. What: The 98-seat restaurant serves a range of premium sashimi, as well as omakase meals (from $138 a person). Their Sashimi Tairyo (for six people) is priced at $360 and includes tuna belly, amberjack (kanpachi), prawn and flounder. Diners can also pick seafood from the seafood trolley, which will showcase the freshest catch such as Alaskan King Crab and oysters. What: For a coffee break, head to the Japanese bakery-cafe, which serves pastries as well as coffee (from $4 for a double espresso) made from Brazil and Panama beans. A small selection of salads (from $5.80) and sandwiches (from $8.80) is available for takeaway. What: For those who want a quick meal, the ready-to-eat section has takeaway meals such as bentos, salads and sushi platters - priced between $5 and $10. On the project which was conceptualised in September last year, Mr Lim says: "I didn't want to do another restaurant. I wanted to sell quality produce at reasonable prices. What sets us apart is our live seafood and aged meat options. We are different from Meidi-Ya and Isetan supermarkets... with household items. We specialise in food." His experience in the industry comes from his former position as chief executive of Shin Group, which runs Japanese restaurants Shin Kushiya and Kiraku, and Cafe Crema and Asian bistro Verandah. He remains a stakeholder in the firm. Prices at Emporium Shokuhin's gourmet grocer are 10 to 20 per cent cheaper than those in supermarkets, he says. Produce is flown in three times a week, mainly from Japan and Europe. After considering more far-flung options in Sembawang and Jurong, Mr Lim chose to open at Marina Square as he notes that the area is "experiencing a revival". As for the mall's rodent problems, he calls the issue "unfortunate" and is prepared with traps for the pests. This is likely to be the only store here and he is eyeing markets overseas such as Shanghai and Jakarta. By the end of next month, he is also looking to supply live seafood to businesses and launch an e-commerce platform for consumers. Emporium Shokuhin's opening adds to the competition in the Japanese food scene. Existing players include Isetan and Meidi-Ya supermarkets, RE&S Group's Kuriya Japanese Market retail spaces, as well as gourmet grocers such as Zairyo and Ethan's Gourmet. 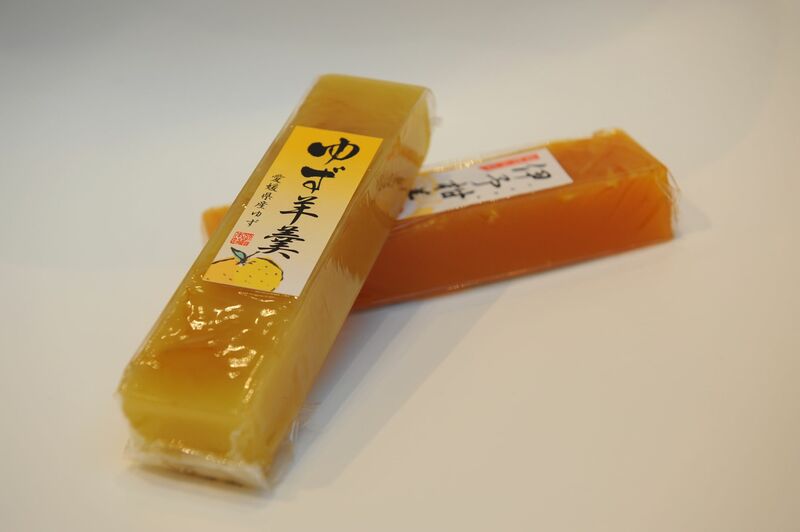 They note that unique items are key to attracting consumers, who are willing to pay for quality Japanese ingredients. Over at Ethan's Gourmet in Tagore Lane, co-founder Elaine Yee, 34, notes that average spending per customer is $100 to $150. Unique items at the 10-month-old grocer include Marusho tomatoes (rainbow tomatoes) and Tajima beef. Ms Yee says: "Singapore's market is too small and does not have so much demand, unless the products are special." For Ms Amanda Tan, 26, co-owner of online grocer Zairyo, business has picked up since it opened in November last year, specialising in Japanese produce. Like Emporium Shokuhin, she imports and distributes the products directly, so prices are 15 to 50 per cent lower than those in supermarkets. She gets an average of 150 orders a month, with spending at $200 a customer. To stand out from the competition, items for Zairyo are carefully curated, such as its range of uni (sea urchin) and seasonal fruits from Tokyo's Tsukiji fish market. Ms Tan says: "We're always on the lookout for food trends in Japan before deciding to bring in new items. It is pointless selling the same stuff as everyone else, unless the quality is better or if the product can't be found here." She adds that while Japanese suppliers are open to exporting their produce, they are likely to stick to one distributor in each country. Agreeing with Ms Tan, RE&S Group's marketing communications manager Yeo Ai Lin adds that customers request for items such as kegani (hairy crab), Hokkaido uni, sekogani (snow crab with roe) and Aomori apple. Average spending for each customer can exceed $300 for these premium products. She says: "Consumers are increasingly well-travelled and appreciative of quality foods. Japanese produce is known for its superior quality and excellent taste. This creates a strong demand." The brand serves more than 100,000 customers every month, with total sales of more than $1 million across its six Kuriya outlets in locations including Great World City, Causeway Point and Jem. A seventh outlet will open at Tampines One next month. Kuriya's products are also sold online on Rakuten and Qoo10 and it is working on building its own Web store.